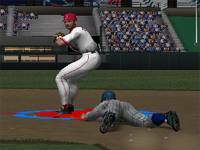 989 Sports has taken another swing at baseball with their all-new MLB 2004 for the PS2. Not content with simply upgrading the existing game, this release features improved controls, graphics and new gameplay modes that should make for a more comprehensive, deeper simulation. However, the series has always lagged behind the other franchises, and the question is whether this reconstituted MLB 2004 can compete with the other top games on the market. Join us as we take a swing and find out if their patience was worth it. Taking off last season on the PS2, 989 instead released a baseball title for the PS1 which was relatively decent. While this strategy seemed a bit dangerous in the short run, baseball is the one sport where console dominance is still up in the air, so waiting until you have your best stuff ready to go seems like a good idea. Players will immediately notice the improvements in the game, which should make MLB 2004 a serious contender this season. MLB includes 12 different single and multiplayer modes that range from quick arcade thrills, to deeper sim-oriented management modes. If you want the depth and richness of multi-season baseball, you can build up a team over a 10 year period in the Career mode. You can also play for a single season with the manager mode. One interesting mode is the Spring Training mode, where you can create and follow a rookie prospect. You start by creating your player and then play him in six spring games. The prospect earns points for his play on the field and if he earns enough, his dream will come true and he'll join the roster. Spring Training mode is surprisingly well done and gives you a strong rooting interest in the game. Other modes include the usual Home Run Derby and a Fast Play mode, where you can eliminate innings and rules for swift games. Players can also skip over the marathon season and start with the All-Star Game, playoffs or, the World Series. MLB's Team Manager mode allows you to take the reigns of the front office. Here, you make the decisions and can build up your franchise by trading and buying players, and acquiring free agents. You can also see what the other teams are up to and pick up players in the pool or who are on the disabled list. Managers can also view each players stats to change their rosters. Your decisions are made easier because MLB 2004's statistics track the players in 100 categories throughout the season in both offensive and defensive categories. These extensive stats can trace an individual player for up to a decade should give players plenty of numbers to crunch. Looking at these stats can also show which players are hot and which are cold. This is essential information that will help you determine your starting lineups, configurations and starting rotations. MLB 2004's manager mode will also allow you to keep track of injured players and the attributes of active players. Your ultimate goal in the management mode is to acquire and hold onto key players, gradually building your team up until they are serious contenders. After a few seasons, you can even reach the playoffs and the series. Once the season ends, you and your team can earn MVP awards, and other trophies such as the Cy Young award or even the coveted World Series rings. These modes are all impressive, but MLB 2004's gameplay really shines when you step on the field. The biggest change in this edition is MLB 2004's radically redesigned gameplay interface, labeled with the 989's "Total Control System" slogan. It lives up to this promise because the controls are incredibly intuitive and are a significant improvement from 989's previous baseball titles. When you're on the mound, you'll have a much greater degree of control over the ball and cal change the type, location and velocity of each throw with the touch of a button. You can also call up in-game scouting reports to check on a player's status instantly, which will allow you to shut down the opposing batters. This makes for a much more strategic and balanced game that emphasizes the cerebral managing aspects of baseball. Some of the strategic moves you can use include double switches, pitch-outs and changing the outfield closer or farther away. Players can also change pitchers, substitute players and adjust their infield positioning. Figuring out when to use these is critical, and can become the margin between victory and defeat. MLB 2004 also features scaled strike zones and extensive bullpen options will allow you to keep the other team off balance. MLB's batting system has also undergone major revisions that allow for plenty of flexibility. The improved interface and batting cursor makes hitting much easier. Players will also find hot and cold streaks easily displayed. Players can also choose to deviate from expectations by bunting or charging the mound. This easy to learn, yet surprisingly nuanced system does an excellent job in recreating the feel of being in the batter's box. You'll have to make split-second decisions about whether to hit for contact or power. An effective batter will try to outsmart the opposing pitcher and guess which pitch he'll throw next, though the game's AI is smart enough to be unpredictable at points. You'll be rewarded for waiting for the right pitch, and waiting can also be used strategically to wear down a pitcher, since the game simulates player fatigue. After an extended period on the mound, pitchers will gradually become fatigued and their performance will worsen. Their control will worsen the longer they're up causing them to lose their stuff the longer you stay in the batter's box. It's a small thing, but this gives the games a very similar texture to real-life baseball. The fatigue factor also plays into your roster decisions, since you'll need to see how much a pitcher has rested before placing them on the mound. Of course, defense plays a very large role in MLB 2004, and mastering fielding is essential, because you want to be able to limit damage when contact with the ball is made. The game is quite good in this department as well. You can position fielders to a much greater degree of accuracy. MLB 2004 has an excellent handle on this department as well, and the game allows for more sophisticated plays including diving catches, throwing on the run, tighter catcher movements plus textbook relays and pick-offs. Performing these moves is simple and intuitive with excellent button mapping and responsive controls that are easy to learn. This allows you to keep aggressive runners in check with a great deal of ease. The improved fielding controls are excellent, and allow you to defend against power hitters and keep extra bases to a minimum. MLB 2004's more sophisticated AI has been programmed in consultation with real major league players, which gives the on-field action a much more authentic and engaging feel that is incredibly accurate. Additionally, certain players go into slumps during the season, which is another cool touch that makes the game feel more realistic. Graphical realism plays a key role in the appeal of any sports title and MLB 2004's production values are impressive. MLB 2004 includes all 30 ballparks rendered in incredible detail, right down to the bleachers and Jumbotrons, giving it an authentic feel. The players themselves look decent with excellent motion-capturing that marks a big change for the better. They animate beautifully and look impressive throughout, with realistic running, sliding and batting animations. The game uses a new technique called motion blending that smoothens out the transitions between these animations, which gives the game a more cohesive appearance. This gives the animations are more seamless quality that makes switching from a running to a throwing animation look surprisingly natural. Players have several camera angles to choose from including far away and close-up angles. 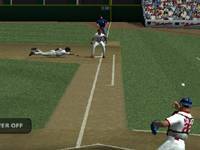 MLB 2004 also features a decent replay system, though you can't adjust the angles on these as you can in other games. The batter-pitcher interface is excellent and makes it easy to throw and hit the ball. MLB 2004's menu system is also well designed, and text boxes appear unobtrusively on the side of the screen. MLB 2004's audio makes it sound like a real professional game with great sound effects including crowd chants, broken bats and umpire calls. You can also listen to the play-by-play announcing from Vin Scully and color commentary Dave Campell. Taken as a complete package, MLB 2004's production values are smooth and polished, making it one of the better looking PS2 baseball titles we've played to date. Overall, this is a vastly improved franchise, that definitely deserves a second chance. It's got some impressive play modes, that offer both fast action and deep strategic gameplay. While the management and player creation modes aren't as robust as they could have been, the package is still well-rounded thanks to its excellent on-field play mechanics. The biggest recommendation are the controls, which are dramatically improved and much more intuitive than they were in previous games. The game does a good job of recreating the feel of Major League Baseball and since it has all the player and team licenses, MLB 2004 has an impressive level of authenticity. Patience has paid off, and this is an impressive effort from 989, that shows the developers have learned from past mistakes. 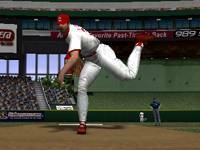 MLB 2004 is a promising rebirth for this long running franchise. It's tight controls and above-average graphics will definitely please gamers looking for some solid baseball action.